popular Real-Eyes with enamel iris/pupils installed by the manufacturer, and guaranteed never to pop out. Saves time, and you never have to worry as to whether or not you have the right size stick-on eyes. Gold eyes have chartreuse irises, nickel eyes have yellow, red, or pearl irises. These are a take off of our original Real Eyes where you simply add Prismatic tape eyes. The Sculpin Helmet is an exciting, new style of Fish-Skull with a realistic, flat and broad profile that imitates common bottom-dwelling fish species such as sculpins, gobies and baby catfish. 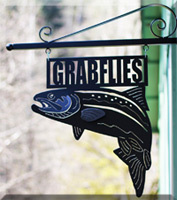 Designed for use on both hook and tube flies it allows anglers to easily tie weighted streamers that fish deep and imitate these popular predator food sources. Fish Skull Sculpin Helmets are amazing additions or heads on streamers, saltwater flies and lake patterns. The Fish Skull Sculpin Helmet is very easy to add to any fly before or after tying the main body of the pattern. 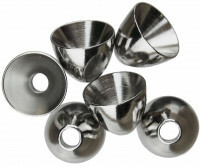 Hareline Tube Cone Heads The cones have large diameter center holes to fit over tubes. Medium 7/32"
Brite Beads(TM) have a patented counter drilled hole to allow them to be easily added to most any hook shank. 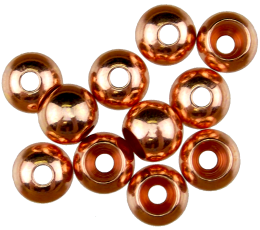 Our Brite Beads are different that those of our competitors in that pay the extra price and go to the extra effort to ACID ETCH THE GOLD PLATING on each bead. It is not a cheap or fast process....but the results speak for themselves. You get a bead that has a uncompromising finish and a bead that will not tarnish. 1/4 inch size is great on Moal leeches and Intruders. The Fish-Skull design mimics the head, eyes and gill plates of a baitfish producing a more realistic looking profile. This is the size for Intruders, Moal Leeches, Steelhead Nymphs. Each eye has a flashy base with a solid black pupil. 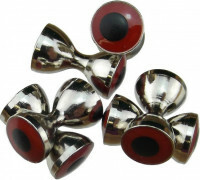 Size: 3/16" fits Cross-Eyed Cones 3/8" medium. Colored tungsten eyes are ready to tie on and use. The offset axis lowers the center of gravity and centers the eye on the hook shank. 10 per package. Diameters are 1/8" for small and 3/16" for medium. If you want your bead head flies to sink fast, tungsten will sink them the fastest. 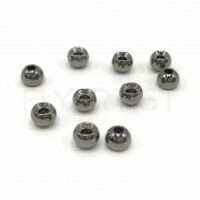 Hareline's tungsten cyclops beads feature countersunk holes to allow them to easily slide around the bend of your hook. Perfect for tying patterns like the copper john, prince nymph, pheasant tail nymph, and wooly buggers. The heaviest beads for their size and available in 7 sizes and 4 colors. 10 beads per pack. 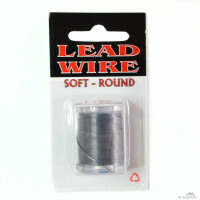 A quick and effective way to add weight to your presentation, the Hareline Spooled Lead Wire is a must-have for getting your presentation completely dialed-in. Perfect for wrapping around the shank of the hook.